Review key financial data as transactions are entered. 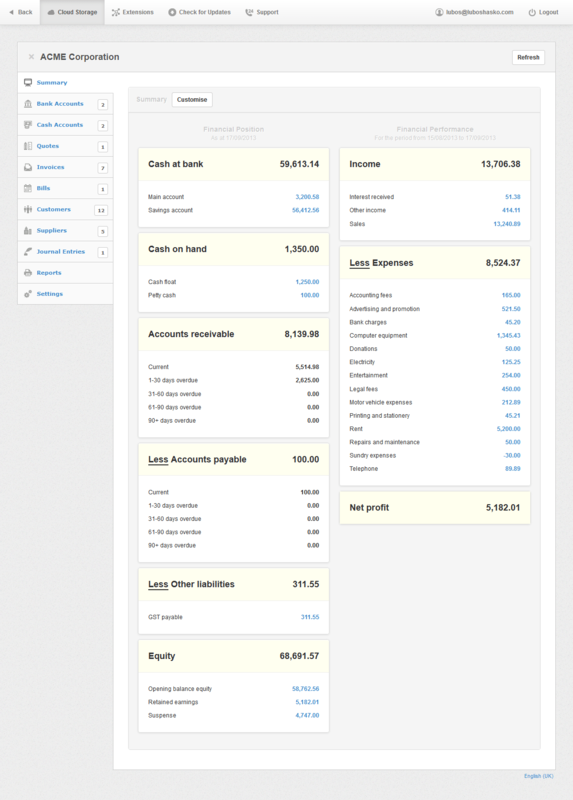 Track bank account balances, accounts receivable, accounts payable, transaction taxes, income, expenses, profit and more. Enter receipts and payments from bank accounts, credit facilities and business loans. Import electronic bank statements. Use the automated bank reconciliation to avoid manually matching transactions to bank statements. Record receipts and payments from cash accounts such as petty cash, cash floats or other cash accounts. Create quotes for prospective customers showing prices and other terms of the sale. Quotes may be converted to invoices when they are accepted. Create invoices for customers showing details of products, services, prices, taxes and payment terms. Enter bills payable to suppliers and monitor the amounts owed and payment due dates. Enter customer contact details to assist with sales and other information used for invoices and quotes. Enter supplier contact details to assist with purchasing and entering bills. Record expenses paid out of pocket or by personal credit card. Record transactions or adjustments into general ledger and subsidiary ledger accounts. Includes balance sheet, profit & loss, trial balance, general ledger, tax reports, receivables, customer statements and payables. Create price list items for products or services to be entered on sales invoices. We are adapting Manager to country-specific tax systems. If a country-specific tax code is not yet available, custom tax codes can be created for VAT, GST or sales tax.